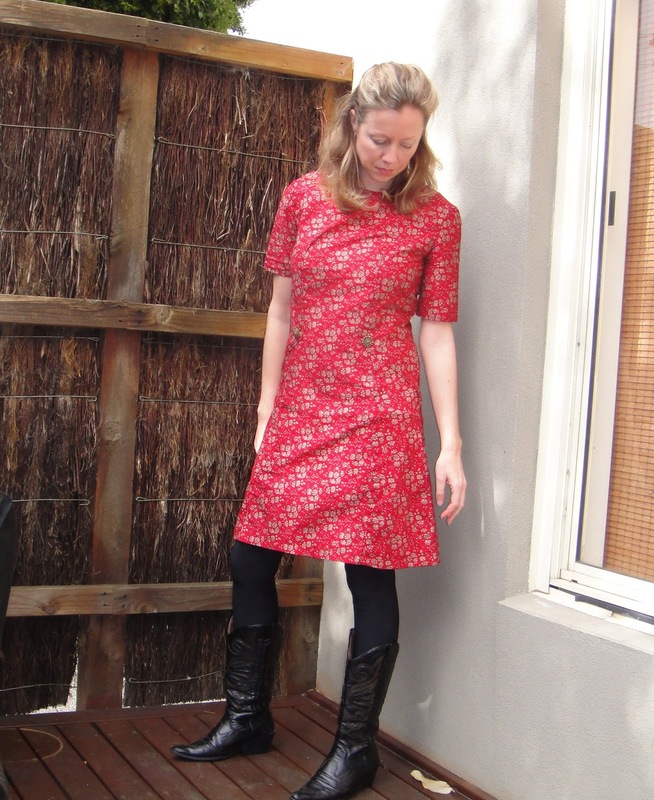 I have a new red 'vintage' dress, I didn't buy it *I.made.it*! Remember the 60's vintage pattern and fabric I purchased in Vinnie's half price sale? It has taken me a few weeks, but I finally completed my dress today. I stitched, I unstitched, and stitched again, then threw it to one side thinking I wouldn't succeed. I unsuccessfully completed a 'hidden' zip, and had to start all over again. But I didn't let this dress get the better of me, and I won. Everything on this dress is recycled and has been purchased on the thrift; the fabric, the vintage pattern, the vintage buttons, the zip, even the thread. I did however, use my brand new overlocker, and trusty sewing machine to make it. It is not perfect, there are faults of which I am learning from, but how satisfying to say I have made my own dress, completely from scratch, and all of it made from second hand materials. Love the heels with it, too! oh fantastic! and now that you have mastered the pattern, you could use it for a 2-tone dress, would look completely different but use the same pattern.. a further saving! Just to exhibit my complete dress making ignorance to the world.....where you've cut the pattern out have you cut it to your size, or can it be reused for other sizes? Hey Ang. Usually patterns are printed to all sizes, and you can cut along the line appropriate to your size. Then, if you cut a smaller size and require a larger size in future, you could tape it back together with the discarded larger pieces but this might be fiddly. In this case, the pattern was only for a size 10, but a conversion table was included to make the pattern bigger. Hope this makes sense? Good Job! I love vintage patterns but sometimes you can't trust the sizing and the pieces are sometimes funky but you did a GREAT job with this one. I love vintage-y stylings! Wow, that looks like it was a little difficult. Good job Erica! Looks cute on you too. Pretty! Looks like a great fit- nice work! This dress is amazing!!!! You look great in it! I'm glad you didn't give up! Very nice!! looks great on you!! wow impressive! looks so good!! So cute! I'm a little in awe of clothing made from entirely second-hand materials. I don't know if it's just the op-shops near me, but I find that most of them don't even carry patterns & assorted sewing items anymore. Great job, I'm trying to make more clothing from hand. I managed to add some vintage patterns to an old pair of jean shorts which made them stand out nicely. I would like to make more things like this.